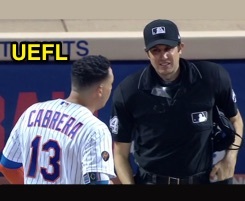 HP Umpire John Tumpane ejected Mets 2B Asdrubal Cabrera (strike three call; QOCY) in the middle of the 9th inning of the Yankees-Mets game. With two out and none on in the bottom of the 8th, Cabrera took a 0-2 slider from Yankees pitcher Dellin Betances for a called third strike. Replays indicate the pitch was located over the outer half of home plate and thigh-high (px -.627, pz 1.994 [sz_bot 1.535]), and that there were no other callable pitches during the at-bat, the call was correct. * At the time of the ejection, the Yankees were leading, 4-3. The Yankees ultimately won the contest, 4-3. This is John Tumpane (74)'s second ejection of 2018. John Tumpane now has 10 points in the UEFL Standings (6 Prev + 2 MLB + 2 Correct Call = 10). *This pitch was located 3.444 horizontal inches from being deemed an incorrect call. This is the 55th ejection report of the 2018 MLB regular season. This is the 26th player ejection of 2018. Prior to ejection, Cabrera was 1-4 (SO) in the contest. This is New York-NL's 1st ejection of 2018, 3rd in the NL East (WAS 3; ATL 2; NYM 1; MIA, PHI 0). This is Asdrubal Cabrera's first ejection since March 23, 2017 (Angel Hernandez; QOC = U ["Time"]). This is John Tumpane's 2nd ejection of 2018, 1st since May 20 (Kyle Schwarber; QOC = Y [Balls/Strikes]).